Lately, I’ve noticed many referencing Isaac Newton’s and others’ descriptions of present-day persons’ ability to see further, standing on the shoulders of Giants. This metaphor, inspired by Greek mythology, has been used in various forms since the early 12th century. It was even used as a clue recently, in the Jeopardy! game show. So what does it mean? Stephen Hawking aptly describes the intent: “Each generation stands on the shoulders of those who have gone before them, just as I did as a young PhD student in Cambridge, inspired by the work of Isaac Newton, James Clerk Maxwell and Albert Einstein.” Identifying inspirations over time, we can see the accretive nature of leadership growth and stature. Discussions of “standing on the shoulders” pays homage to those who have led us to the point where we are elevated and informed by their work, situated before a vista where we see new possibilities and opportunities. But we must go further with a call-to-action to pay it forward — elevating our contemporaries and those who follow. 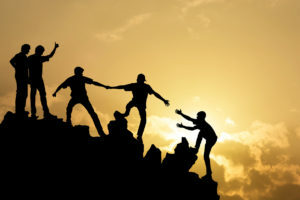 I envision leadership as a vertical process, much like Napoleon Hill’s example of successful persons having arms outstretched in two directions—upward to be uplifted by those preceding and downwards to pull forward those following. Rather than the image of the sole mythical Giant bearing the sole dwarf on his shoulders, I see the metaphor as advising an iterative process—one where we are called upon to join an emerging scaffold or pyramid of inspiration and vision. Stick to your vision or passion — Plant your feet firmly, staying true to your north star or vision. Even small wobbles can affect your stability and that of others. 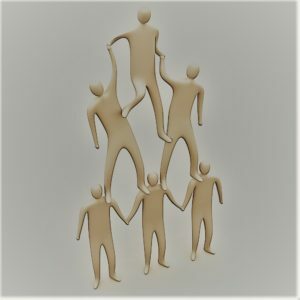 Think of the equilibrium required by a cheerleader doing a human pyramid trick—maintain focus, while being attentive to what’s going on around you. Use a spotter — Using the cheerleader analogy again, safety is enhanced by having a spotter. This could be a colleague who helps you recognize any variation from your purpose, to be there to catch you in the event you do fall and set you back on your path. I recently have seen mention of radical candor, as a means of effective feedback—great asset for stability. Listen to others. Work out regularly — Exercise your intellect. Know your stuff, continually learning; realize that your subject matter knowledge and expertise provides the force necessary to balance precariously while effectively shouldering the efforts of others. Shift roles as indicated — Remember that our roles within the broader team or tribe will vary over time. 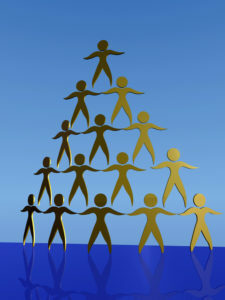 Regardless of where we are in the pyramid, promote engagement of others. Be appreciative of those who preceded you and encouraging for those who climb higher. Celebrate the milestones of your team-members. Maintain enthusiasm — Think of the cheerleader analogy. Remember and remind others of the importance of the work ahead. Display an infectious level of eagerness and passion for the chosen purpose.